Our portfolio company Flurry is the leading provider of mobile analytics. They have analytics installed in over 140,000 mobile apps running worldwide. Through this global reach, they have a lot of data on how many iOS and Android devices are in operation throughout the world. They wrote a blog post yesterday laying out this data and some analysis they did on it and this graph jumped out at me. These are the numbers of future potential users of mobile apps worldwide based on total market size, ability to afford smartphones, and the current penetration of each market. 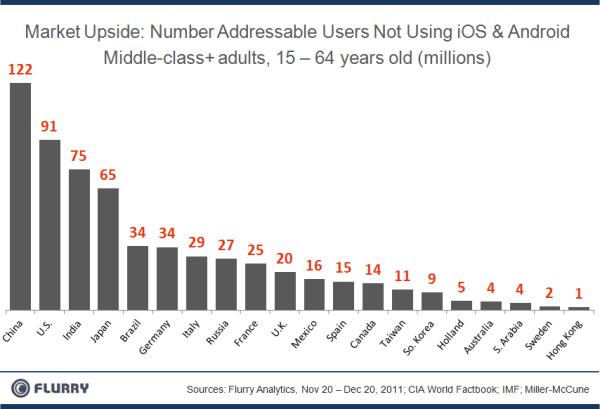 Beyond the US, mobile developers should focus on the BRIC countries (Brazil, Russia, India and China) plus Japan and then western europe. And if you believe that mobile will be the dominant platform for all web/internet activity going forward (as Marc Andreessen hints at in this interview), then web developers may want to focus on these markets as well.